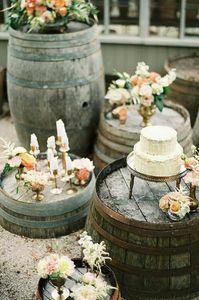 With their rustic charm and versatility, whiskey (and wine) barrels are an easy way to really bring your wedding decor from drab to fab. From flowers stands, to cocktail tables we've found some great whiskey barrel styling ideas for your big day! Keep clicking for more ideas, and be sure to check out the whiskey barrel DIY here. See more of this Texas Vineyard Wedding here photographed by Cory Ryan Photography. See more of this Rustic Blue and White Wedding here photographed by Ivy and Gold. See more of this Vintage Barn Wedding here photographed by Kirsten Julia. See more of this Romantic Sonoma Wedding here photographed by Onelove Photography. See more of this Classic North Carolina Wedding here photographed by Graham Terhune Photography. See more of this Burlap and Lace Wedding here photographed by Heather Lynn Photography. See more of this Rustic Santa Barbara Wedding here photographed by Jen Rodriguez. See more of this Aldergrove Wedding here photographed by Chiffon Photography. See more of this Lush Summer Wedding here photographed by Peaches and Mint Photography. See more of this Newport Wedding here photographed by Dana Pleasant Photography. See more of this Elegant Charleston Wedding here photographed by Dana Cubbage Weddings. See more of this Newport Wedding here photographed by Ruth Eileen Photography. See more of this Calico Skies Winery Wedding here photographed by Jeff Sampson Photography. See more of this 1920's inspired wedding shoot here photographed by Kat Willson Photography.